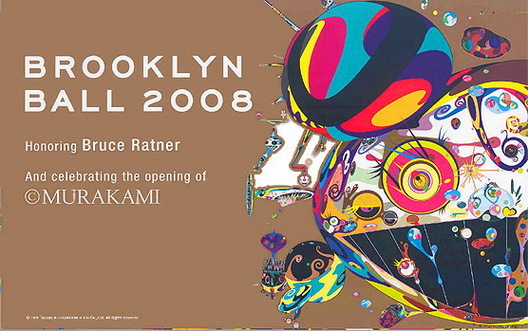 An "Open Letter to the Brooklyn Museum"
It is uncomfortable to step up and point out why it is inappropriate for the Museum to be "honoring" Ratner, but it is crucial...I do not believe it is appropriate for a respected public institution like the Brooklyn Museum to be honoring Bruce Ratner. To many of us this is obvious but I will explain the many reasons why. A museum should be a good neighbor to its community. You cannot be a good neighbor by promoting the activities of someone who is a bad neighbor, and worse, to the community....Terrible time for the Museum; excellent time for Ratner- From this we may infer that the decision to honor Ratner was not driven by the careful considered judgment of those Museum board members with the best interest of the Museum at heart, but rather by those on the board with business connections to Ratner exerting influence. The lengthy, full letter is posted here. City Responds to Public Place Worries, Downplays "Fugitive Dust"
The city has responded to concerns about work underway at the Public Place site in a letter sent to City Council Member Bill de Blasio saying that the current preliminary work doesn't pose a threat, but that a water truck and other steps will be taken to contain "fugitive dust" when concrete removal gets underway. 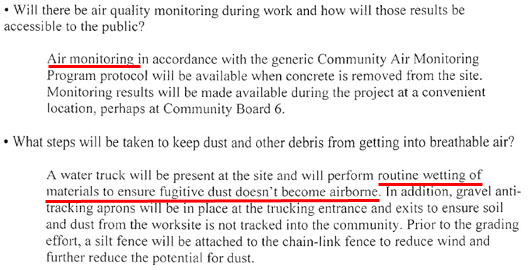 Residents have already complained about "fugitive dust" being stirred up by work that has already taken place. Mr. de Blasio had sent a letter with a long list of questions to the Department of Housing Preservation and Development. HPD responded with a memo from the Mayor's Office of Environmental Coordination answering the questions. The city says that some air monitoring will take place once concrete removal gets underway at the site and that it will take steps to minimize the dust including a water truck. In addition, it says measures will be taken to make sure soil "is not tracked into the community." The memo says that clean soil will be placed at the site after the concrete is removed and that "underlying tar-contaminated soils will not be exposed during this limited concrete removal activity." The city also says that it will not monitor air quality at the Smith-9th Street station because "fugitive dust will not be an issue at the subway station." The actual site cleanup is still in the future as a plan must still be developed by Keyspan/National Grid. 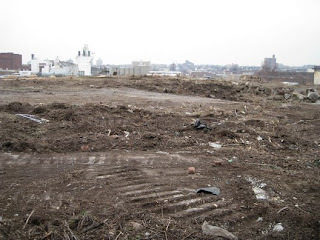 Last week, a team from the Toll Brothers came to Carroll Gardens to present the developer's plans for a big development on the shores of the Gowanus Canal. 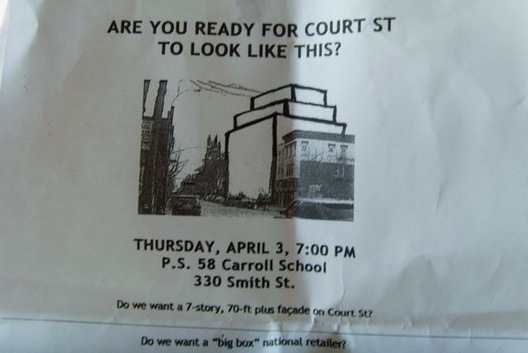 This week it's the Clarett Group's turn as they come to the neighborhood to show plans for the controversial building at 340 Court Street on the site of the former International Longshoreman's Association building. Unlike the Toll Brothers, which needs to go through a full land use review process because the firm needs special zoning to building its project, the Clarett Group needs no city approvals to go forward, other than pro forma okays from the Department of Buildings. Because of existing zoning, the developer would actually have been able to build a structure up to 20 stories in the existing neighborhood. The building they are proposing, which is being designed by Rogers Marvel, will be seven stories. A large turnout is expected for this open meeting, which will be hosted by the Union-Sackett Block Association, with support from local elected officials and community groups, including the Coalition for Responsible Development and the Carroll Gardens Neighborhood Association. After the Clarett Group and its architect present the current plans for 340 Court Street, the community will have the opportunity to react and respond...This meeting presents an opportunity for the community to have its voice heard and for the Clarett Group to signal whether it is willing to work with local communities on contextual and responsible development. While the public presentation to Community Board 6 by the Toll Brothers was a relatively controlled and polite forum, there are likely to be more fireworks at this community meeting. On Saturday, in preparing for the meeting, neighborhood blogger PMFA notes that opponents tethered balloons and floated them 70 feet above the site to demonstrate how tall the Clarett Group building would be. The meeting will take place on Thursday, April 3, at 7PM at PS 58, which is located on Carroll Street between Smith St. & Court St. There is more on the meeting at the Union-Sackett Blog. For all of the intense reaction to the Toll Brothers proposal to build a 447 unit development in Gowanus, the project would not be far out of line with what the city is likely to propose for the neighborhood. The outlines of the city's plan won't be known for a bit, but buildings of 10-14 stories have been discussed for parcels along the canal, with 10-12 stories being the most likely outcome, which is the height of the Toll buildings. The property the Toll Brothers want to develop will fall within "Zone B," which is likely to be rezoned for mixed used projects. 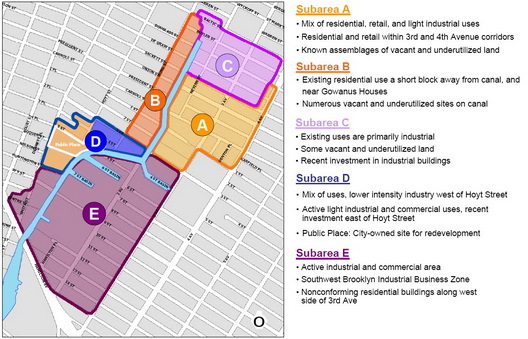 (In the map below, the use of both Zone A and Zone B is likely to be primarily residential and commercial; the battleground zones in terms of preserving industrial uses are Zones C, D and E.) While the rezoning may limit buildings along Bond Street to 4-6 stories, the general framework would allow taller buildings along the canal. The development is also in keeping with what the Bloomberg Administration wants to develop on the Public Place site, where buildings would also rise to 12 stories. In fact, the Public Place development, only a few blocks away could be more than double the size of the Toll development. On Thursday night Toll VP David Von Spreckelsen said that the developer was going ahead and asking for their parcels to be rezoned because they were considering the possibility that the city's rezoning might not be done before the end of the Bloomberg Administration. It might also be a way get somewhat more density than the city might ultimately allow. Yet, the Toll plan is remarkably similar to what is likely to emerge from City Planning very soon. Anyone with any doubts about what the city intends along the canal need to envision the rezoned Fourth Avenue, but along the Gowanus and with provision for public access and esplanades along the water. Yes, if the city's rezoning fails to pass before the end of the Bloomberg Administration and if a Mayor disinclined to rezone the neighborhood takes over and if the real estate market continues to go down the toilet in terms of speculative Brooklyn development, the Toll project would be a singular development in a relatively industrial corridor. Yet, there is a very good chance that the Toll development will be exactly like the Gowanus future that the city would like to achieve. We're not trying to be apologists for the developers--and we have major issues with the plan that's on the table--but the fact is that the Toll Vision is very similar to the Bloomberg/City Planning Vision for the New Gowanus. While the Toll Brothers development is an important battle, the city's own plan--which is likely to be on the table before long--is the war itself. As we noted last week via an email we got, work has started on an expansion of the Roebling Oil Field project, aka the Roebling Oil Building and/or Warehouse 11. We found the pile driver on scene on Sunday and a petroleum-like smell wafting from the scene, though as far as we could tell the aroma was coming from the creosote soaked piles that are being driven. The interesting part will come when the site is excavated. Was the oil contamination on the site limited to the end of the property where the pollution was removed and the building has already been put up or is there more to clean up? 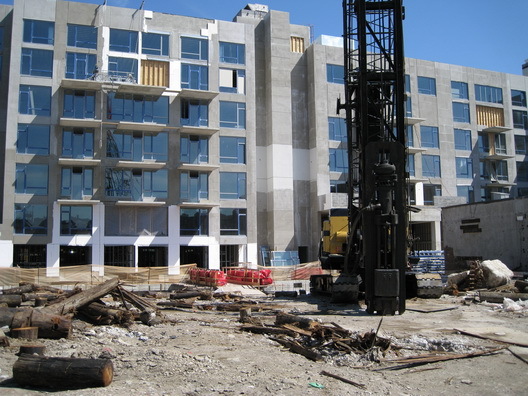 It is with a very heavy heart we conclude that there will be no more Construction Site Du Jour awards for one of our Lifetime Achievement Award winners, 250 N. 10 Street in Williamsburg. The site as can be seen in the photo above, went seriously metal last week. 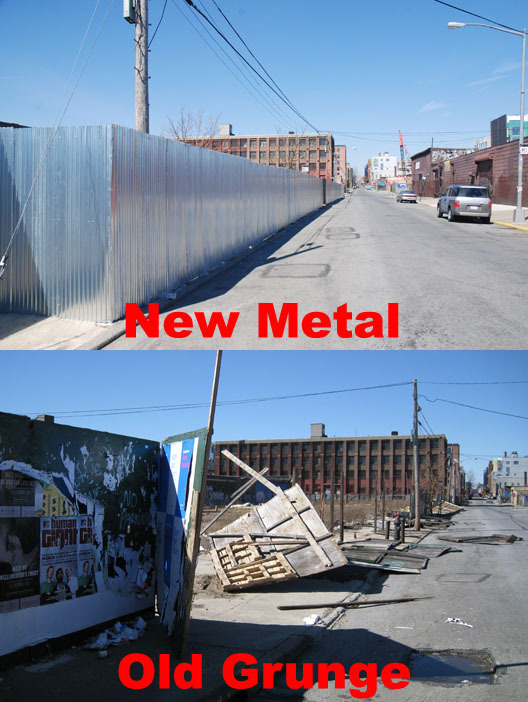 The crappy fence that had graced the site for a long time and allowed thing like the potential for people to play with a pile driver was removed and replaced by the Cadillac of Fences. Our friend had been hit with a "failure to maintain" violation from the Department of Buildings and a Partial Stop Work order. Interestingly, the fence comes from Parking Depot & Systems Inc. In any case, the site seems destined to be a six-story building with 147 units and an entire block that will be filled with new construction. Assuming, of course, the credit crunch and real estate market issues don't team up to take a bite out of something on the block. The new building would come from SLCE Architects. 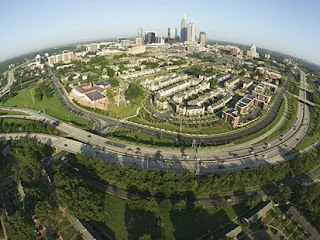 Here We Go Again: Is There a Park Slope in Charlotte? There is no place like the Slope! But does anything come close in Charlotte, NC? With so many NY/NJ families moving to that area, perhaps it is possible. Is there an area that is as kid and pedestrian-friendly, helpful, and progressive as PS? Being artsy and liberal would be a plus, but that would be a tall order I think! Also, what is the Park Slope of Staten Island? Our Carroll Gardens Correspondent grabbed a shot of the former site of some cool public art near the Union Street Bridge in Gowanus. Leading us to wonder whether a fraying piece of public art is preferable to the maroon paint job that succeeded it. In any case, the "before and after" juxtaposition is interesting. From Driggs Avenue at N. 11 Street in Williamsburg. In coordination with Bears from Bergenfield, all donations will be sent to children in Israel who have been victims of terror, are in shelters or who are in the hospital. 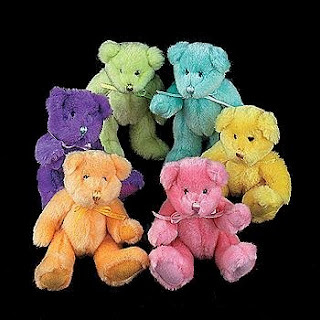 Bring new or gently use stuffed animals to Congregation Mount Sinai, Main entrance, 250 Cadman Plaza West between Clark & Tillary Streets. So, if you're doing a cleanup and want to put a smile on a child's face, drop off times are Tuesday, Wednesday and Friday from 9:30 AM - Noon, Monday & Tuesday afternoons from 2:00PM - 4:30 PM and Monday & Wednesday evening from 6:30PM - 8:00 PM. For more information, you can email schanzerconsult (at) hotmail (dot) com. 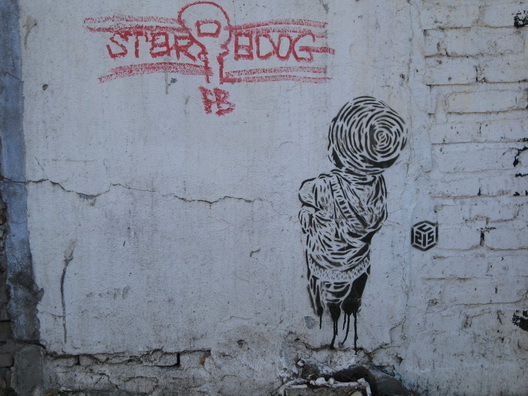 We ran a somewhat earlier photo of this artwork yesterday along with some other Burg street art, before we found that it had been updated in a most amusing way. 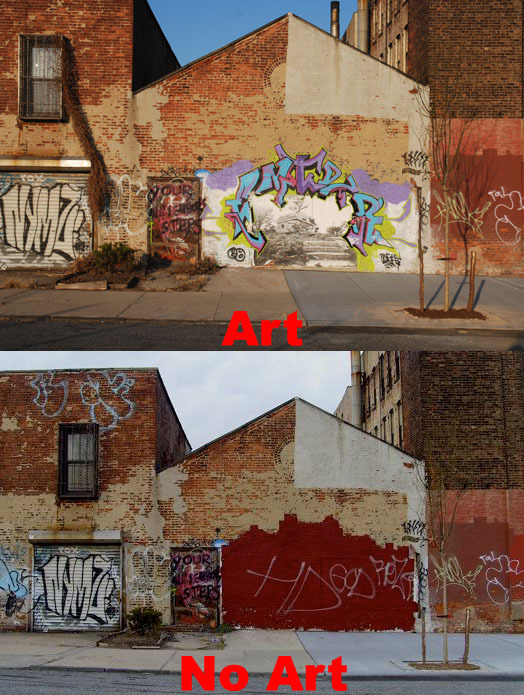 It is from Wythe Avenue in Williamsburg. 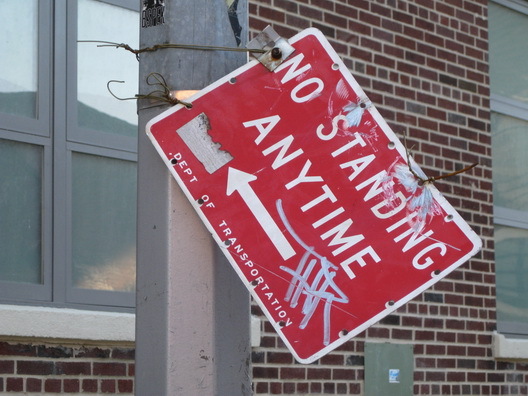 From Dumbo comes a No Standing sign that has seen better days and is now just sort of hanging there. If you're interested in the topics of trash and trucks, there's a meeting with representatives from the Department of Transportation and the Transportation Committee of Community Board 1. It will take place tonight, (3/31) from 7PM-8:30 PM at the Buckley Center at St. Cecilia’s School which is located at 1-15 Monitor Street. 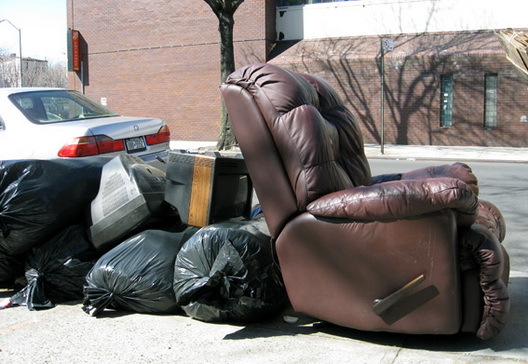 This plush and once-proud recliner comes to us from Dekalb Avenue in Bed-Stuy where Miss Heather found it communing with a couple of old TV sets. While the staging suffers from the fact that the TVs have been carelessly placed behind the recliner, it's still easy to picture kicking back in it and watching. There is very early morning gloom outside the Brooklyn weather observatory today as the forecast calls for clouds "with a little rain" and a high of 51 degrees. Tonight will be mostly cloudy and breezy with a shower in places. The low will be 46 as we inch toward weather that is more or less spring-like. 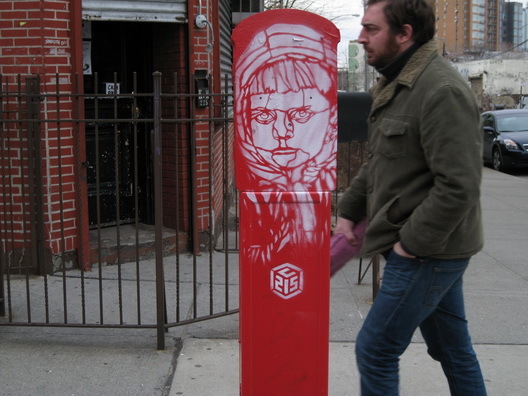 The amount of street art one finds in Williamsburg has been decreasing exponentially with each passing year in the 2000s to the point where only finds a small amount of what was around even three years ago and a fraction of what one could find seven or eight years ago and even less than before that. 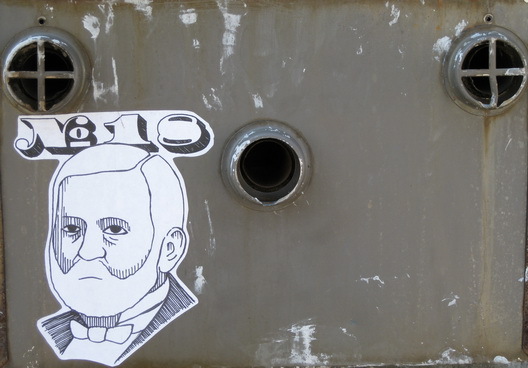 In any case, here is a random sampling of some that has popped up in the last 4-6 weeks, with a major focus on the C215 stencils that showed up around the third week of February. 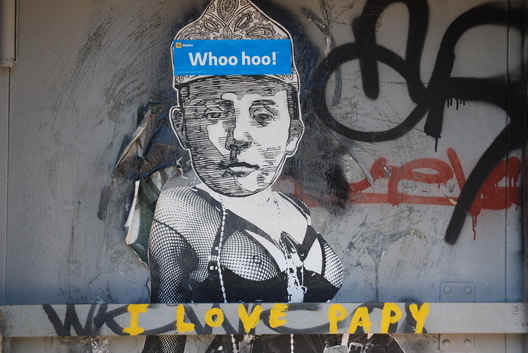 There is a full Flickr set of them posted by the artist and, of course, all things street art always pop up on the Streetsy site. 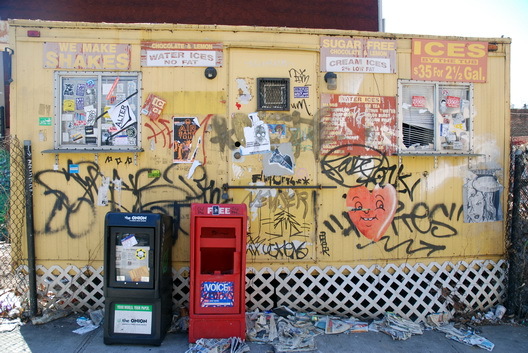 Disconnected in Brooklyn on Craigslist: Cortez the Killer? 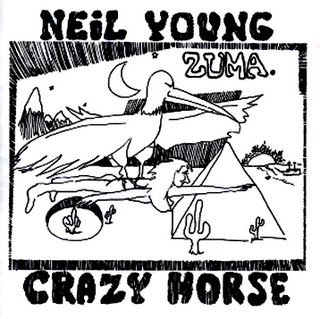 Get out those Neil Young MP3s. I live in a rent stabilized building. Recently the landlord has been demanding that he inspect everyone's apartment and when he comes he has come with 3 architects and they measure the whole apartment and take pictures while consulting a floor plan. Most of the tenants have complied because he has told them it is for insurance purposes and they are afraid to cause a problem. We have recently heard rumors that several of the buildings our landlord owns may either be up for sale (to Methodist Hospital potentially) or are slated for conversion to condos. Does anyone have any great resources as to tenants rights in this case--or perhaps even direct experience that would help us short cut the list of questions we have? 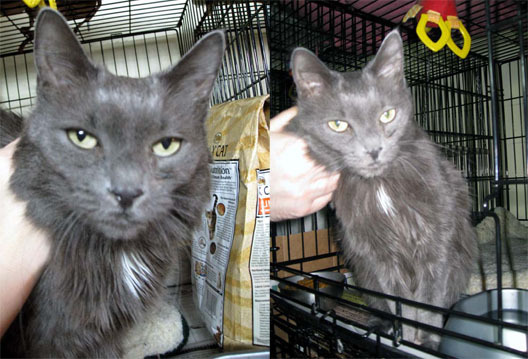 Mama is a really mellow domestic long hair...She is accustomed to living with other cats. We also suspect that she would love to have a new home. We have an large soft spot for older animals whose lives have been upended by losing their homes. If you're into making a gorgeous elder cat happy who clearly craves love, give Mama a home. She'll love you for it and you get bonus good karma points. For info on BARC click here. New Brooklyn is a film coming this fall from Christopher Cannucciari. All we can say is that the trailer features so much of the Williamsburg landscape we've photographed and posted about that we feel like we know it without even watching it. We like them, so we're posting two vids here. The IMDB plot summary is as follows: "Brooklyn struggles for it's identity during a period of gentrifying change. Marta (Blanca Lewin) is new to Brooklyn. Her roommate Angela (Shelley Thomas) has helped her adjust, but when Marta is assaulted by Angela's brother Eddie she must learn to take a stand on her own." Upcoming: "Twilight Becomes Night" at Boerum Hill Assoc. Mtg. 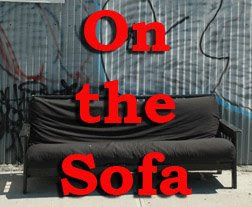 This film examines the devastating impact neighborhoods suffer when local businesses are forced out by rising rents and competition from chain stores. Coucilman David Yassky will attend and share legislation he is developing for the City Council. Filmmaker Virginie-Alvine Perrette will share her knowledge and answer questions. Refreshments will be supplied by Apartment 138 (138 Smith St.). 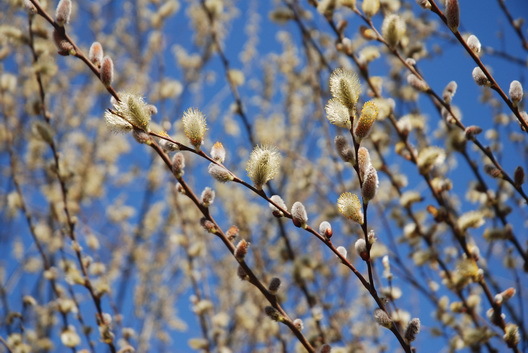 Our Annual Greening Meeting will take place Wednesday, April 23rd. A lot more info about the film at its website. Toll Brothers Team Talks Up the Gowanus Project. "It was all a bit scary, that group, parading in single file with their renderings and statistics. They were like a team from Walt Disney with visions of the future complete with a shrinking machine and flying cars. I had a mini fantasy of myself: soaking up rays along a processed canal of filtered water, waving to my husband on the Water Taxi to my own private dock, racing with the 8 hour shadow being cast from my glass box. I also saw that maufactured forest of transplanted trees, swaying in an artificial breeze downwind from the unfiltered part of the canal while slipping on my wellies to wade through the flood plane to my above ground parking garage. Sigh...it's just too big, too ambitious..too much what we want, but, not enough of what we need in a realistic context." Brooklyn's Ugliest Karl Fischer Looking Great. "I love the 2 faux balconies over the entry. Class-o-rama, and such grand vistas of the BQE. The sole good omen for this project, is that it is where Sugar The Cockatoo 'flew the coop' to this past october. It confirms his tastes...Glad there was a bland bright spot to fly to. Thank you, Karl Fischer!!" Pampered Burg Rock Star Dogs, Part II: Plush Toy Edition. "This Dog Addiction place says in their manifesto that they "encourage pack behavior". I see this as a huge problem. And do dogs really need and want rock music 24/7? With their hearing? This place sounds like trouble." With Public Place Work Underway, Safety Questions Remain. "NIMBYs? Do you live in the neighborhood? Are your windows constantly covered with white dust from the concrete factories? Do you smell the stench from the canal? Those of us with children are concerned about heavy metals and other contaminants getting into the air in high concentrations - to toxic conditions directly below the surface are well documented - and if I lived next to or down wind of this site, I'd be very concerned." 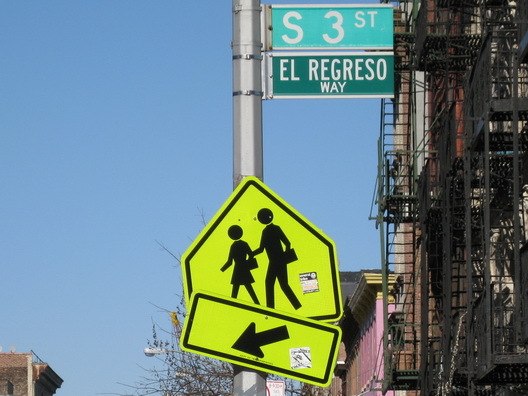 Always look out for the crooked pedestrian crossing sign, especially on S. 3 Street in Williamsburg. 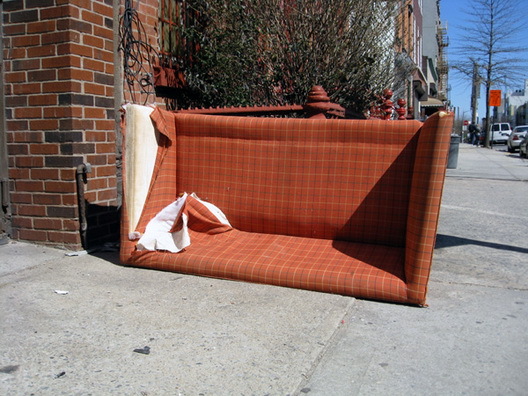 It is hard to say anything about this overturned Greenpoint sofa except that Miss Heather calls it the Green Street Tartan based on location and pattern. 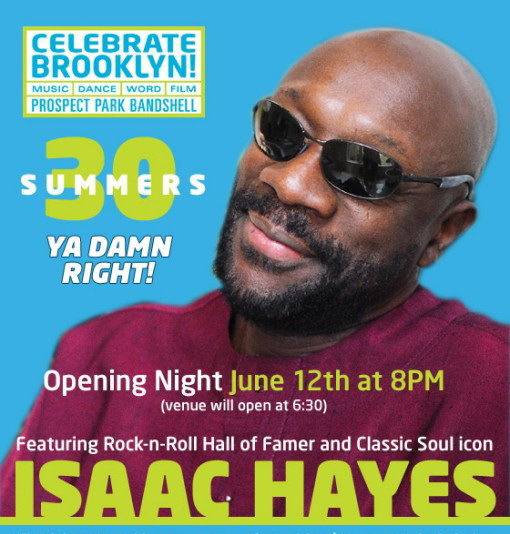 Official Sign Summer is Coming: Celebrate Brooklyn!!! 08/03/08 Daby Tourethe goods before anyone else. Of course, that's just scratching the surface. More info as it comes out, including the full schedule release very soon. For all of you who've been endlessly frustrated by the roller coaster ride that is G line service levels, Save The G is asking you to turn out in force on April 8th. 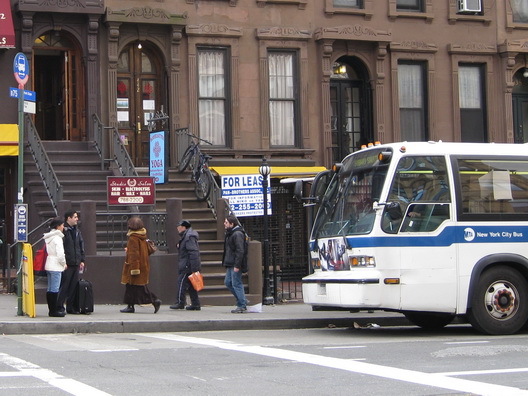 Riders from Queens AND Brooklyn have been affected by the MTA's various management decisions and random service changes. If you'd like to more directly help spread the word about the hearing, Save The G can certainly use your help. Please reach out to savetheg@yahoo.com with your contact information, noting what sort of advocacy contributions you can make, and we'll be sure to thank you in person on April 8th. This is a major opportunity for G riders to speak and be heard; let's make the most of it! Updates at the Save the G blog. Here's this week's adoptable pet of the week from the Brooklyn Animal Rescource Coalition (BARC) shelter in Williamsburg. 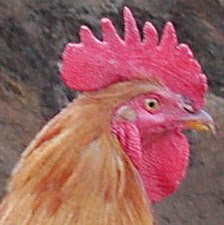 This is Aponte. 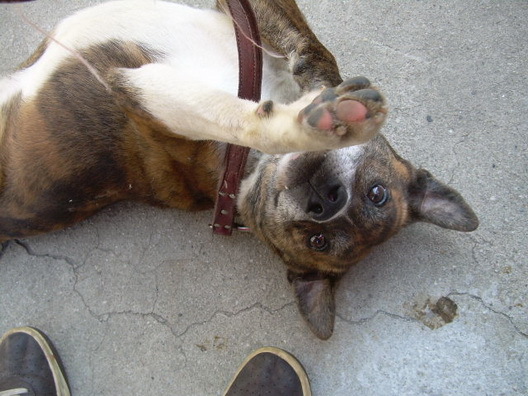 He was liberated from Animal Care and Control and is one happy, friendly dog! He was skinny, and his handsome brindle coat a bit dull when he arrived at BARC, but he's well on his way to becoming a former shelter dog success story. Aponte is about 50 pounds of pitbull mix, and approximately 3 years old. To meet him in person contact BARC. If you're not ready for a serious commitment, BARC's volunteer dogwalking program is a great way to get a canine "fix" and maybe meet your next best friend. Clearly, any potential adopter has to decide if a particular creature in need of a home is right for their living situation, needs and their ability to provide the proper level of care and attention. 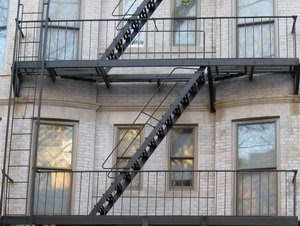 The BARC Shelter is located at N. 1 and Wythe in Williamsburg. More info about them here. 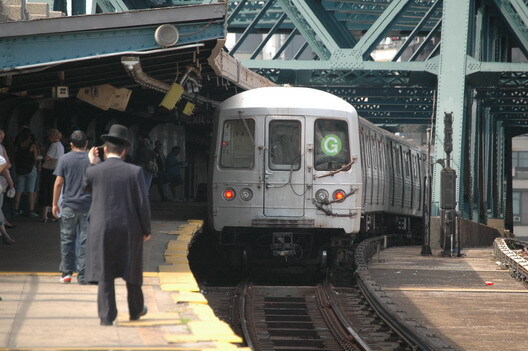 The report cards will also be available on the MTA website by clicking here. (Currently the link leads to surveys for Staten Island buses.) in city’s most populous borough. The report card asks for ratings on 19 elements of service including wait times between buses, seat availability, clarity of bus destination signs, whether the bus operates on schedule, cleanliness, lack of graffiti and scratchitti, courtesy of the driver, "ease" of paying the fare and more. Grades are from A to F and there's also an overall rating for the route. Surveys will be handed out on buses and can also be done online (starting April Fool's Day). The survey will run through May 23. Well, the joey at the Prospect Park Zoo, who was the sujbect of a naming contest, has been named Riley. The four finalist names were Nari, Kylie, Kinta and Riley. The Borough President made the announcement yesterday. 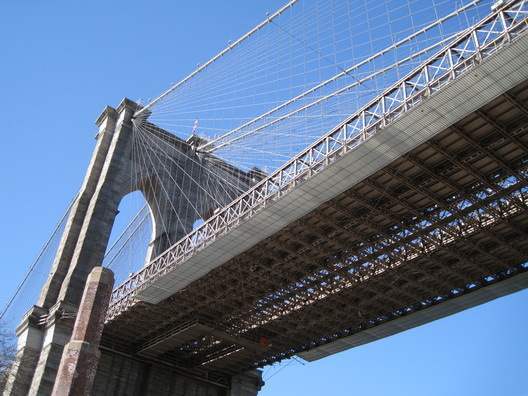 The Wildlife Conservation Society and the Heart of Brooklyn conducted an online poll and received hundreds of suggestions. A press release says the name Riley was submitted by Allison Make. 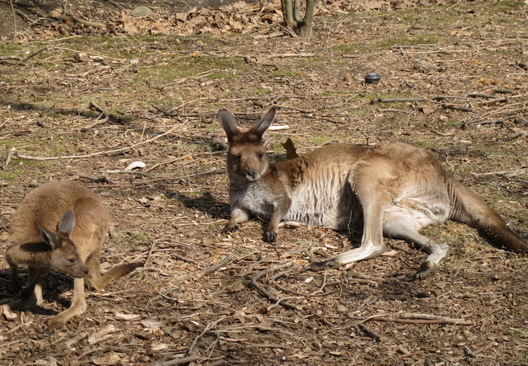 Riley is the third kangaroo to be born in Brooklyn, and the Prospect Park Zoo is the only zoo in the Northeast with western gray kangaroos. We were pulling for the name Coney, but politics and getting votes is a tough business. Riley is nice. But there is something about the details, they have found, that moves people to wisecracks. 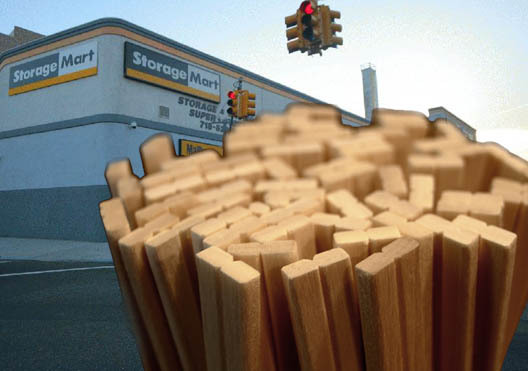 Mostly the fact that, as Carly Sullivan, a spokeswoman from the city Department of Buildings confirmed this week, the Brooklyn storage locker collapse originated in a unit on an upstairs floor that was holding thousands of pounds of chopsticks. The utensils, packed tightly into boxes, got too heavy and caused the floor to collapse, breaking a water pipe and flooding units below. Mr. Clark’s run of bad luck is the subject of the Dispatches feature in this week’s City section, and building residents said there were other 475 Kent refugees in a similar position. 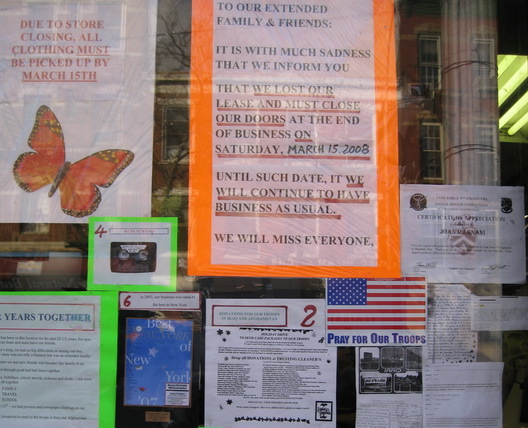 Kirk Edwards, who, like Mr. Clark, is a photographer, said that he had moved his possessions out of the StorageMart at 50 Wallabout Street, the site of the collapse, just days before it happened. (Mr. Clark moved most of his things out too, but had left some behind, and that was what was damaged.) Several residents also mentioned a neighbor who may have had his prized record collection in the lockers, though I wasn’t able to track him down for confirmation. 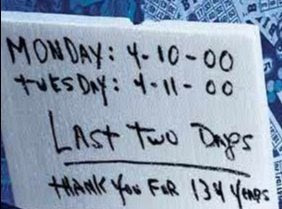 Read the full story, it's got some great detail about the ironic Chopstick-Matzo Connection at 475 Kent. Yesterday, we posted about the presentation by a team from the Toll Brothers about their big and controversial project on the Gowanus Canal. Here are some renderings of the development, which has been designed by GreenbergFarrow with landscape architecture by Lee Weintraub, which we posted yesterday on Curbed, but didn't feature here. 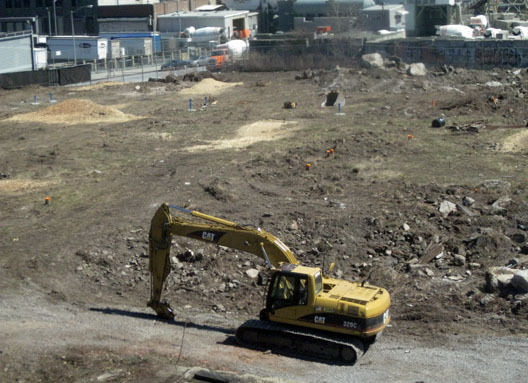 Preliminary work is underway at the Public Place site between Smith Street and the Gowanus Canal, with residents already expressing concern about safety precautions during the cleanup of the highly contaminated site. On March 31, representatives from the New York State Department of Environmental Conservation, Mayor's Office of Environmental Coordination and KeySpan/National Grid will make a presentation to Community Board 6. Topics will include the level of environmental contamination, remediation plans for the site and the next steps in the cleaning process. The meeting will take place at 6:30PM at Long Island College Hospital, which is at 339 Hicks Street in Conference Rooms A+B. People living near the site are concerned that was work has started before their questions have been answered. 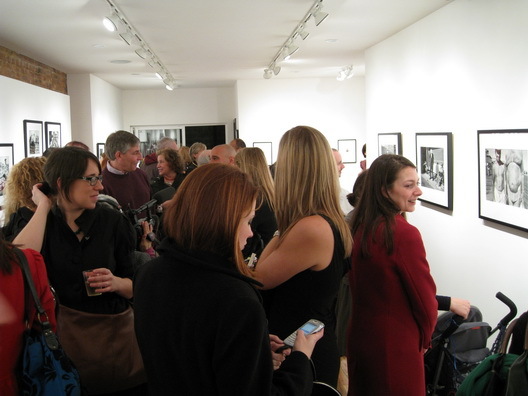 This was the scene on Thursday night at the opening of Coney Island of the Heart at the Bond Street Gallery in Gowanus. The neighborhood's first photography gallery is "housed in a 100-year-old townhouse. Inside, it has exposed brick walls, and out back is a tranquil courtyard." The show features photos shot by Harold Feinstein and "celebrates the history of Coney Island as the playground of the working-class melting pot through exuberant and singular images of the Jews, Italians, African-Americans, Russians, Puerto Ricans, and others who have played there." The gallery is located at 297 Bond Street. There was a showing of James White Photos going on at the dance studio next door as well. That photo is below.